It’s good to see you, too. Well, are you ready for another obscure videogame? Ah! Ah! Hold on, Narrator from Planet X, we promised the GameCola audience that we would clean up our act this month. That means no potty humour, no questionable innuendo, and absolutely, positively NO swearing. WHAT? YOU MEAN I CAN’T CURSE UNTIL I PASS OUT? Nope. And considering that’s pretty much your thing, I’d recommend that you just sit there with your hands on your lap and observe complacently while I tell the nice readers about this month’s obscure game of choice. HMPH…VERY WELL… SO WHAT “GEM” DO YOU HAVE FOR US NOW? It’s a game about ninjas! NINJAS? I GUESS THAT’S NOT SO BAD. THE YOUTH OF TODAY SEEM TO HAVE AN AFFINITY FOR NINJA CULTURE, FROM THE REVIVAL OF THE NINJA GAIDEN FRANCHISE ALL THE WAY TO HAVING THEM APPEAR IN ALL SORTS OF WILD SITUATIONS ON YOUTUBE VIDEOS. That’s right! Ninjas are definitely hip characters, defining both stealth and the swift movement of their blade in the name of justice. But they were definitely around long before their repopularization on the Xbox. They were cool even in the days of the Famicom (the Japanese NES, for those not in the know). Many ninja-based games were released, but not all of them made it overseas. One cheerful bunch of ninja games that never shined on American shores (for the most part) is the Ninja Jajamaru-kun series. The NES saw one of the earlier games, under the title Ninja Kid, but that sure didn’t make anyone’s Top 10 list of anything. There were also two Game Boy releases called Ninja Taro and Maru’s Mission. Heard of either of those? Didn’t think so. (Maybe these could be the subject of a future article?) But I’m not concerned about those at the moment. 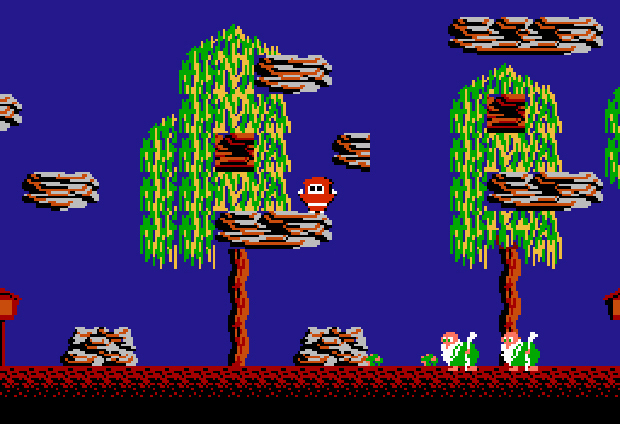 I’m focusing on a Famicom-only, Japan-only Ninja Jajamaru-kun game called Jajamaru no Daibouken. TELL ME ABOUT THAT PARTICULAR GAME. Well, what can I say… You play the role of this stumpy little ninja in a red costume who travels through 20 stages, fending off ghosts, skeletons, devils, and other demonic creations with a shuriken attack. When you kill an enemy, a spirit comes out that you can collect. Also out there to collect are coins, bombs (which consequently kill the ninja), and accessories like a skateboard or a temporary invincibility potion. But really, your ultimate goal is to get to the end of the level. Technically, you could just run there and not defeat a single foe. Once you get to the end, you’re transported to the boss, which requires a few shuriken to dispose of. It’s basically like a classic arcade game. Unfortunately, it has the unpleasant appearance of an old arcade game, it certainly sounds like one, and it also suffers from one of the oldest cop-outs in the book: the stages repeat infinitely. There’s no ending, so don’t bother praying for one. If you can find a copy, it’ll do you good for five minutes of fun. The most likely outcome will be boredom after those minutes are up. You’ve been relatively silent this time around. I guess a profanity-free environment really takes the wind out of your sails. YOU FORGET SOMETHING, THOUGH: WE ONLY AGREED TO MAINTAIN A FAMILY-FRIENDLY ATMOSPHERE THIS MONTH, SO I KEPT MY MOUTH SHUT. BUT NEXT MONTH IS A FREE-FOR-ALL, AND I’M GOING TO SWEAR LIKE NOBODY’S BUSINESS. AND YOU…YOU ARE GOING TO BRING IN SOMETHING OBSCENE FOR US TO SEE! Oh dear, I think trouble is brewing. Children, make sure NOT to read the June edition of “Gamera Obscura.” It could be dire. I wish, deep down inside, that next month sees Rapelay or Toilet Kids in Gamera Obscura. I am very much aware of Rapelay, but… um… I don’t think I even want to touch that one. The premise lacks sufficient basis for humour. I look forward to the next installment of this column, no matter what it may be. I’ve never understood the appeal of the “beep-boop-beep” music, either. The retro-gaming snobs may cast a pox upon me, but I’ll take the crisp, clear tones of a Street Fighter arcade game or Mega Man console (SNES and above, thank you very much) anyday.